Firefly pose, or tittibhasana in Sanskrit, is an arm balance that requires flexibility, strength and focus. 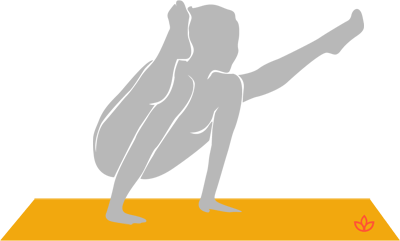 Similar to shoulder pressing pose, the yogi balances on the hands, but extends the legs to the sides. Begin in a squat with the feet wide. Lift the hips and thread the arms between and behind the legs. Place the palms on the floor behind the heels. Lower the hips and shift the body weight back. Inhale and lift the heels from the floor. Extend the legs to the sides. Exhale and release the feet to the floor.